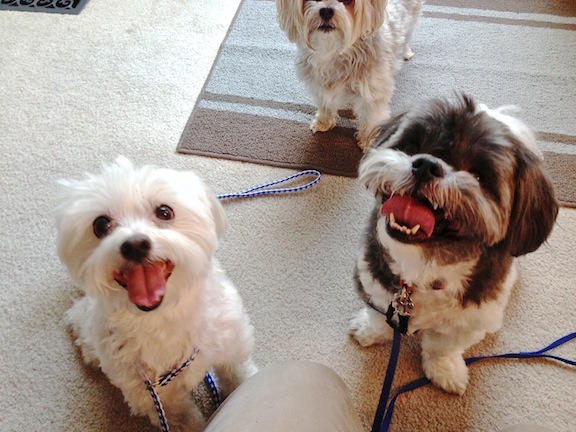 Tuffy is a ten-year-old Maltese, pictured here on the left with her roommate Snickers an eight-year-old Shih szu mix. Although there are four dogs in the home, I was only called in to work with these two. Tuffy had a problem marking in the house, barking at people when they arrived or get up to move around the room along with some nipping when people try to leave or move when she didnt want them to. Snickers had recently begun to bark at night to protest being placed in his kennel and was also showing signs of aggression when out walking: barking aggressively and lunging at anyone who came near while he was on the leash. When I arrived for the session, all four dogs were kenneled and barking away in four dog harmony. I asked their owner to let the dogs out so that I could observe their normal behavior and how they greeted guests. All four dogs rushed up to me barking excitedly, but Snickers and Tuffy were clearly the most animated. I corrected the other two dogs and was able to get them to stop barking. But Snickers and Tuffy continued unabated so I had their owner bring out leashes and we placed them on both dogs. Tuffy obliged and allowed the least be placed on very easily, but Snickers avoided the situation by walking away. I had to follow him around a bit until I was successful in placing him on the leash as well. As soon as Tuffy and Snickers were on the leash, they immediately stopped barking. Their owner looked up at me surprised when I pointed this out to her. Often times, introducing a leash can have a dramatic impact on a dog and its behavior. I suggested that from now on whenever either dogs started a barrage of barking, their owners immediately introduce a leash as a consequence. When we sat down to discuss the situation, I asked a few introductory questions; one of which was what rules, boundaries or limitations the dogs were expected to follow. As I asked this question, one dog jumped up on the couch next to me, another jumped on the chair to sit with his owner and another one jumped up on the couch on the other side of me. When you have a balanced, well-behaved dog you can get away with not having any rules. But if you have multiple dogs, and some of those dogs are not balanced, having rules and limitations in place is crucially important. I suggested that they initiate a few very simple rules that will have a dramatic impact on how the dogs perceive their owners in terms of leadership. Number one is to restrict access to any of the furniture. Because dogs equate the height at which they sit to their status amongst their peers, allowing them to get up on the furniture whenever they desire gives them the idea that the dogs had the same rights and authority as the humans. I demonstrated the proper way to disagree with the dogs whenever they asked permission to get on the furniture, or more frequently, jumped up without permission. The easiest way to do this is to simply stand up as soon as the dog jumps on the furniture. Turn to face the dog then wave your hand in a sweeping motion to indicate that you’re asking the dog to get off of the furniture. Because there are several dogs in the home and they had been getting up on the furniture for quite some time, their owners are going to need to be very strict and vigilance in their supervision to correct this behavior. If the corrections are delivered at the right time in the appropriate way, the dogs will quickly learn that they’re not allowed on the furniture without permission from their human pack leaders first. I had noticed that the dogs had a bowls with food in as we were discussing the rules for the furniture. This is another small thing that has big repercussions when it comes to dogs. Just like the height at which they sit has a correlation to their status in the pack, so does the order in which dogs eat. Typically in a pack situation the leader or top dog eats first while all of the other members the pack sit and wait at a respectable distance for their turn. By feeding their dogs prior to the humans were eating themselves, the dogs had determined that they had equal or superior status than humans in the home. This is a dangerous or at the very least problematic perception for dogs to have. When you free-feed your dogs by leaving food in the bowl all the time, the dogs do not see the humans as their provider. Additionally since they can eat whenever they feel like it, they have no motivation to do so. This often results in dogs that eat either too much or too little. I suggested their owner dumped both bowls of food back into the bag and start feeding them in a more structured manner. The first and possibly the most important part of a structured mealtime is to have the human eat first. This instantly elevates the human into leadership position and the dogs consequently into a follower position as they must wait their turn. Only after the human finishes eating first should any of the dogs be invited in to receive their food. By inviting the dogs in the one at a time, we are able to control the situation which further elevates us as a leader in the dogs eyes. This also gives the dogs the ability to eat in a calmer manner. Often times when a group of dogs living together, some eat more voraciously than others. Some will attempt to steal food from their roommates. By adding structure and supervision the mealtime were able to prevent that from happening which allows each dog to eat any home nonrushed way. Since feeding is a daily occurrence, this little exercise can make a big impact on how dogs see themselves and their humans. Next we discussed Tuffys marking situation. In a pack environment, only the top dog or pack leader is allowed to mark territory. The fact that Tuffy was marking drapes and other items in the home indicates that he believes that he is the pack leader. I demonstrated the proper way to correct Tuffy whenever he starts to mark as well as identifying the body posture and movements that indicate he was about to mark. With dogs, it’s always easier to correct them prior to the activity than during or after. Once Tuffy sees his owners in a leadership position, his desire to mark should decrease dramatically. There may still be some residual muscle memory or marking out of habit, but promptly correcting him whatever he attempts to do so will help him understand that marking territory is unacceptable to his pack leaders. To further elevate the human as pack leaders, I demonstrated another leadership exercise that they can repeat on a daily basis to help reinforce the leader follower relationship. I demonstrated the exercise with Snickers who only took two repetitions before he understood and surrendered to my authority. I coached all the members in the family through the exercise successfully and gave him instructions on how they should continue the exercise as well as way to make it more difficult and challenging to further accelerate Snickers growth. Because he see’s himself as a leader, this exercise will probably impact Tuffy the most. By practicing this exercise daily with all the dogs in the home, the dogs will quickly start to see their humans as their pack leaders and deferred to their judgment, commands and wishes. This should drastcially reduce and stop Tuffy’s marking. With four dogs it’s going to take a week or two before all the dogs get the picture, but considering Snickers was the most stubborn and picked it up so quickly, I anticipate that there are other members the pack will do the same. Next we fitted Snickers and Tuffy up with Martingale collars to go out for short walk. When we got to the front door, both dogs were rolling and ready to go. I explained how important it is to stop and pause whenever dogs are displaying unusually high energy, anxiety or any other type of unwanted behavior. I literally stopped and waited until the dogs relaxed and calmed down so that i was communicating that we will not move forward in an unbalanced or anxious state of mind. Repeating this pause whenever the dogs get over excited will quickly teach them that a calm balanced frame of mind is the only way to move forward. As soon as I started to open the door, Snickers lunged at the opening. I corrected him a few times and continued to swing the door wide open until I was able to achieve this with him sitting a foot away in a sitting position as the door swung freely in front of him. I always ask a dog to wait and not go through an open doorway until I give permission. This is another small exercise that has big repercussions in terms of the dog seeing us as leaders. It also helps us to keep the dogs from running away. After Snickers mastered the exercise, we walked out the front door and I coached their owners through the same exercise with Tuffy. Since both dogs were able to understand the concept within two or three repetitions, it shouldn’t take long for the dogs to start sitting and patiently waiting at the door whenever it’s opened. Once outside, I demonstrated the proper position and posture for the humans to use when leading the dogs. It’s important when you’re walking a dog that it walks next to us or slightly behind us, never in front. When a dog is in the front of a human, it thinks it is in a leadership position. For a dog that barks or lunges at strangers, this is a bad combination. It took Snickers a few minutes to become comfortable with the Martingale collar, but as soon as he did he fell into a nice heel. As we walked down the block we encountered a few young children on their way to the park to play. I asked if they would help us out and they were nice enough to comply. We had them stand, jump and play in the neighbors yard while we walked the dogs around them. The Martingale collar combined with good timing of corrections and the groundwork done earlier with the leadership exercise, Snickers didn’t growl or lunge at any of the children. Once we circled them a few times without incident, we moved on down the block looking for other challenges to present to Snickers. We ran into another family that was holding an impromptu get-together in their driveway complete with an animated yellow lab who was barking and lunging at Snickers. Usually this is a situation that would trigger aggression, barking and lunging from Snickers, but today he was calm and didn’t respond at all. After we walked a few houses away from their neighbors, my client commented to me on how surprised she was that Snickers didn’t make a peep. She said that was a classic situation that Snickers would react to. By the time that we had returned to their home, both dogs were in a much calmer frame of mind. Clearly the leadership exercises and structured walk had made an impact on both dogs. The fact that they were not reacting to passersby on the walk is a testament to how quickly dogs can transform when they receive communication and leadership that they respect.